Mohammed Saqar, photographed in 2010. "I become very happy when I see that she's happy and she's fine," he says of Dana. 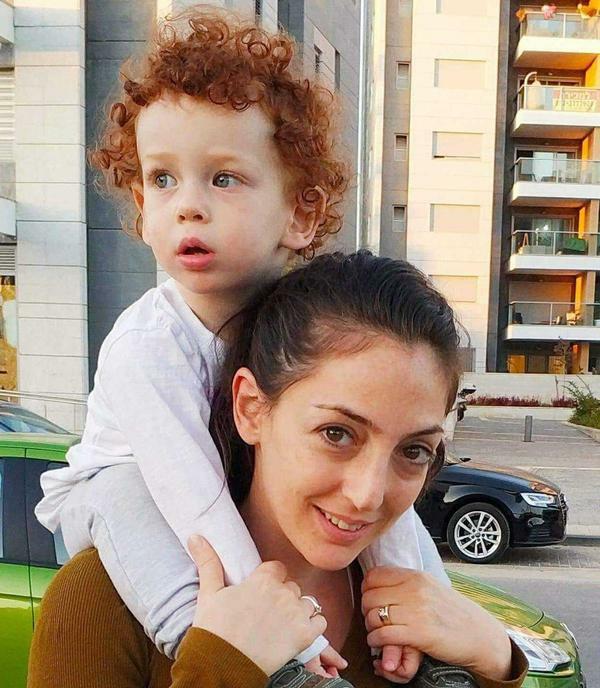 Dana Levy, with her 2-year-old son. She met Mohammed Saqar met when they were teenagers. "When I was young, I started to think, OK, when I grow up and become 25 or 26 or 30, I'm becoming a leader here, she is becoming a leader there, then we can marry, you know, so we can produce new people," he said. "We wouldn't be able to be friends if we talked about politics. How can you be friends with your enemy?" she asked. "Because we are supposed to hate each other, you know? But we don't, so we are just friends." That friendship though has not endured the test of time and war. She continues to live in Tel Aviv and he's still in Gaza. "So much has changed actually," Dana told us recently. When we first talked to Dana, she'd been single and managing a salsa club. Since then, she says she's made the "big jump up" to working as a production manager at a tech company creating motion graphic animation videos for Fortune 500 companies in the U.S. Her family has grown too. "I met my partner, and we have a 2 1/2-year-old little redhead and now expecting our second child," she says. Dana says she can't remember the last time she spoke with Mohammed. "It's been quite a while since I've heard from him," she says. But she thinks about him a lot, especially during the cyclical outbreaks of violence. "We talk about him a lot in my family. He had a very special relationship with my father who's actually more conservative. So they would have these very long political conversations on the phone that would get pretty heated at times," she says. "You know, he was a part of my life." Mohammed didn't want to speak directly to Dana. On a scratchy phone line in the Gazan city of Khan Younis, he says he no longer believes that people who are enemies can be just friends. "I can totally understand him," Dana says. "I think for him it was even more difficult because Palestinians are living in these territories with no electricity and no water. Obviously people are suffering, they're living hand-to-mouth. He is suffering more than I am for sure." She adds, "It's difficult for him to see me as the Dana that he remembers when we were just 14, and not see me as an Israeli who is causing all this pain to him and his family." With their communication cut off, Dana has a message for Mohammed. "I just wish him well and I hope his family is doing well and his parents. And his kids — I don't know how many kids he has now! I hope he's doing well, and just to say safe." Mohammed, meanwhile, now has four sons. 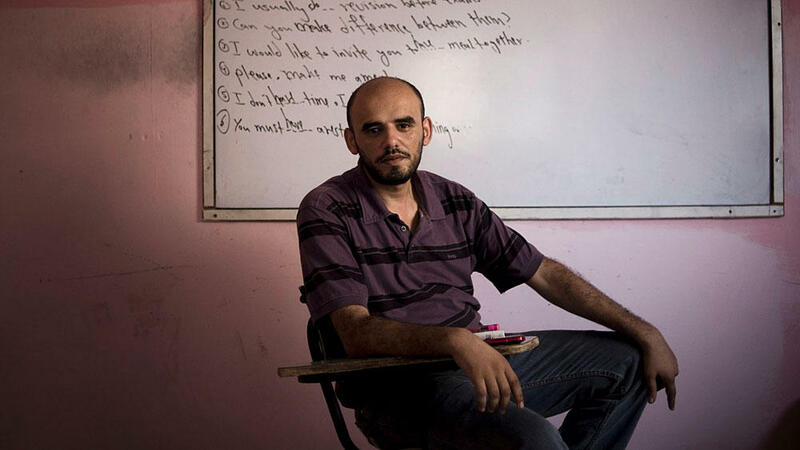 He's still an English teacher and, despite his dreams of studying abroad, he's not been able to leave the Gaza Strip because of travel restrictions for Palestinians. He describes life in Gaza today as a catastrophe. "People here die for nothing. The army and the soldiers kill people daily down here and they oppose the restrictions on Gaza. They are dying of hunger." He says whatever his history is with Dana, he can't speak to her anymore. "I must respect my peoples' suffering and be with their feelings." Since we last spoke with him, there have been multiple deadly confrontations between the Hamas-ruled Gaza Strip and Israel. Mohammed's children have grown up in the shadow of these wars and have suffered as a result. He says a dermatologist told him contaminated water sources are causing new skin diseases to develop in Gaza region. He's also consulted psychologists about his sons' trauma. Mohammed's oldest son has had recurring nightmares of a dead body he saw split in two, the result, he says, of an Israeli airstrike. "He was dreaming of blood and dead people and the dead people are moving and they want to take him," he says. Another son regularly wakes up screaming. Mohammed confesses that he's kept up with Dana discreetly on social media all these years. But social media are also limited in Gaza. "I become very happy when I see that she's happy and she's fine," he says. But he can't help but wonder at the fate of their respective children on opposite sides of a conflict that seems like it will never end. Whenever he thinks of Dana, he can't help but think of the future of her son. "I'm afraid he will grow up one day and be an Israeli soldier and kill the innocent people here. But I still — I love him. I love him." He lets out a long sigh. If you're searching for a missed connection and you want our help, send an email or a voicemail message to weekend@npr.org. There are times when we can connect surprisingly deeply with someone and then never see them again - a missed connection. Eight years ago, when I was a correspondent in the Middle East, I did a story about two people - an Israeli, a woman named Dana, and a Palestinian, a man named Mohammed. They met when they were teenagers at a Seeds of Peace summer camp in the late 1990s in the United States. Both had lost family in the conflict, but they became friends and kept in touch by phone. She lived in Tel Aviv. He was in Gaza. Here's Mohammed Saqar back in 2010 when I met him. MOHAMMED SAQAR: When I was young, I started to think, OK, when I grow up, I become 25 or 26 or 30, I'm becoming a leader here. She is becoming a leader there. Then we can marry, you know, (laughter) so we can produce new people. GARCIA-NAVARRO: And this is a young Dana Levy. DANA LEVY: His people are the enemy, and my people are his enemy, so we have to either decide not - to let it go and just be Mohammed and Dana, and that's it or Israeli and Palestinian, and that's it because we're supposed to hate each other, you know. But we don't. So we're just friends. GARCIA-NAVARRO: That friendship, though, has not endured the test of time and war. We caught up with both of them. And we should tell you this is a missed connection. We could not reconnect, as you'll hear. I spoke first with Dana. We spoke in 2010. And back then, you were working at a salsa club. You were single, living in Tel Aviv. So let's catch up - tell me how life has changed for you. LEVY: So I met my partner and we have a 2 1/2-year-old - little redhead. (Laughter). Now we're expecting our second child. I am now working in a high-tech company. We create motion graphic animation videos for Fortune 500 companies in the United States. It's a big jump up from managing the salsa club. (Laughter). GARCIA-NAVARRO: So when was the last time you spoke with Mohammed? LEVY: So it's been quite a while since I've heard from him. GARCIA-NAVARRO: Did you think about him at all, especially when - during these cycles of conflicts? Did you think about what may be happening? LEVY: Of course. Yeah, of course. I think about him a lot. And actually, we talk about him a lot in my family. He had a very special relationship with my father, who is actually more conservative, like right wing. So they would have these very long conversations - political conversations on the phone that would get pretty heated at times. So yeah, he was, you know - he was a part of my life, and my family knew him. GARCIA-NAVARRO: Dana, Mohammed said he doesn't want to speak with you on the air. He says he doesn't believe any more that people who are enemies can put that aside, like you used to, and be just friends. What do you think about that? LEVY: ...Yeah, in the territories with no electricity and no water. Obviously, people are suffering. They're living hand-to-mouth. He is suffering more than I am for sure. I have no doubt about it. It's difficult for him to see me as that Dana that he remembers when we were just 14 and not see me as an Israeli who is causing all this pain to to him and his family. GARCIA-NAVARRO: Even though you aren't speaking with him directly, do you have a message for Mohammed? LEVY: Wow. I just wish him well, and I hope his family is doing well and his parents. And his kids - I don't know how many kids he has now, but just that I hope he's doing well and to stay safe. GARCIA-NAVARRO: Dana, thank you so much. LEVY: Thank you. Thank you very much. GARCIA-NAVARRO: As you heard there, Mohammed did not want to speak directly to Dana. I reached him on a scratchy phone line in Khan Younis in the Gaza Strip. He's still an English teacher. He now has four children - all boys. And despite his dreams of studying abroad, he was never able to leave the Gaza Strip because of the restrictions on travel for Palestinians. He describes life in Gaza now as a catastrophe. SAQAR: People here die for nothing. The army and the soldiers kill people daily down here. They are dying of hunger also and poverty. GARCIA-NAVARRO: He says, whatever his history with Dana, he can't speak to her anymore. SAQAR: I must respect my people's suffering and be with their feelings. And I cannot do this. GARCIA-NAVARRO: Since I last spoke with him, there have been two bloody confrontations between the Hamas-ruled Gaza Strip and Israel. Mohammed's children have grown up in the shadow of these wars and have suffered for it. Mohammed's oldest son has had reoccurring nightmares of a dead body he saw split in two - he says the result of an Israeli airstrike. SAQAR: He was dreaming of stuff, like blood and dead people, and the dead people are moving, and they want to take him. GARCIA-NAVARRO: Another son often wakes up screaming. Mohammed confesses that he has kept up with Dana discretely on social media all these years. SAQAR: I become very happy when I see that she's happy and she's fine. GARCIA-NAVARRO: But he can't help but wonder at the fate of their respective children on opposite sides of a conflict that seems like it will never end. Whenever he thinks of Dana, he can't help but think of the future of her son. SAQAR: I'm afraid he will go up one day and be an Israeli soldier and kill the innocent people here. But I still - I love him. I love him. It's very complicated. GARCIA-NAVARRO: That was Mohammed Saqar in Gaza and Dana Levy in Tel Aviv. Transcript provided by NPR, Copyright NPR.